This specific Scripps Ranch pool equipment installation was referred to us by another swimming pool company here in San Diego. As they focus on weekly pool cleaning, we often help them out with their pool repairs or new pool equipment replacement. 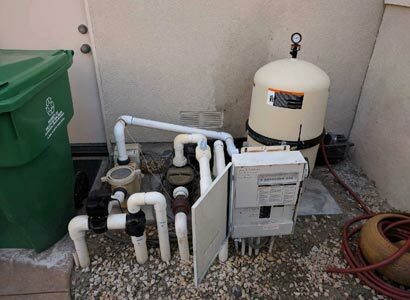 When we were referred to the equipment replacement, they were only thinking about installing a new pool filter pump. The pool service company did properly explain to them that they needed a variable speed, energy efficient, smart pump that is a state law. 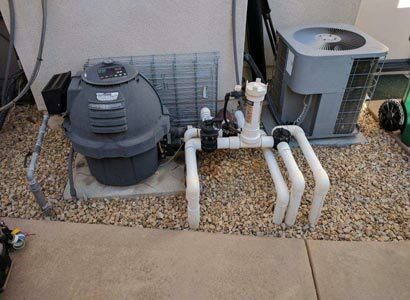 This pool pump is also very cost effective and will save the customer on their electric bill. Upon discussing the replacement of the old pool pump, they also have an older pool controller. This Jandy pool automation will not be compatible with the new variable speed pump and when explained they were interested in upgrading. A few days later, after we sent them the estimate, they inquired about replacing the pool filter, replacing the pool heater, and adding a salt water chlorinator to the pool equipment install. 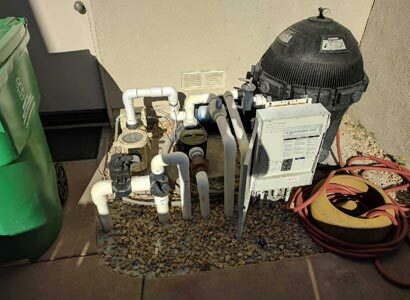 Due to this Scripps Ranch pool equipment being the same age and starting to have issues, they were ready to replace the old pool equipment with modern energy efficient pool equipment. They were also excited about changing this older Scripps Ranch swimming pool into a salt water chlorine system. Below we will explain the type of pool equipment removed and what new pool equipment was installed at this swimming pool in Scripps Ranch, San Diego, CA. The old Sta-Rite pool heater was not heating up consistently and sometimes would not heat up at all. We replaced the Sta-Rite with a Raypak pool heater as the Raypak is the best pool heater in San Diego. The Raypak heater has been used for many decades and only really changing in name and it keeps outperforming most pool heater sold. 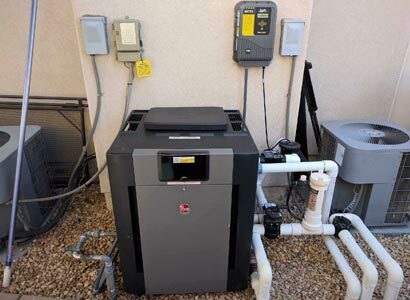 We find that there are fewer problems with the Raypak and that they seem to be the longest lasting pool heater in the field, at least here in the San Diego area. We always go with a Raypak and if it is not the right fit or if preferred will also install the Pentair MaterTemp pool heater. The old Sta-Rite pool filter was a D.E. filter and was old and needed expensive replacement parts. This is why it was a better decision to replace the old pool filter with a cartridge pool filter. These cartridge filters are less messy and easier to clean. Easier for the weekly pool service tech or the homeowner to clean as it requires less technical knowledge and it does not use D.E. to clean the water. The older Jandy pool controller would not have been compatible with the new Pentair variable speed pool pump. Due to this and that the customer wanted to use their pool equipment with their smartphone or tablet. This is why we opted to go with the iAqualink pool automation upgrade. This upgrade will give this Scripps Ranch swimming pool owner full access to controlling the pool pumps variable speeds and functions. While we were going to install a lot of new pool equipment, the homeowner thought it would also be a good time to transition into a saltwater swimming pool. This will give them a more steady stream of chlorine which allows you to run the chlorine levels at lower safer ranges. The Jandy TruClear saltwater chlorine system will also give you the feeling of swimming in soft water and will not make you feel like you need a bunch of lotion when done swimming. Saltwater chlorinators do not remove the need for using chlorine though it greatly reduces it and the swimming experience is more enjoyable. If you are in need of new pool equipment replacement in Scripps Ranch or anywhere else in San Diego County, we can help. We are a licensed and insured swimming pool contractor that specializes in all types of pool equipment repair or new pool equipment replacement. We also provide various pool services to help all of our valued customers.